New law school graduates from the Class of 2015 secured fewer private practice jobs than any class since 1996. Nevertheless, the percentage of graduates who found jobs in private practice increased slightly from the previous year, and private practice remains the single largest source of jobs for new law school graduates. The National Association for Law Placement (NALP) today released Employment for the Class of 2015 – Selected Findings, a summary of key findings from its upcoming annual Jobs & JDs: Employment and Salaries of New Law School Graduates — Class of 2015 report, coming out in October 2016. Despite a drop in the number of jobs and the graduating class size, this year’s Selected Findings describe a flat employment rate of 86.7%, the same as was measured for the Class of 2014. Despite the improved employment rate, the number of jobs obtained has fallen dramatically since 2013, following a period of modest job growth after the recession (see Figure 1). In fact, the number of jobs obtained by members of the Class of 2015 went down in every single job category except for the largest law firms of more than 500 lawyers. The number of entry-level jobs obtained at these large law firms has grown by more than 1,000 over the last four years, but even so, for the Class of 2015 there were still about 1,000 fewer of these positions obtained than there were by the Class of 2009, most of whom were hired before the recession began. Of employed graduates from the Class of 2015, 51.3% found jobs in private practice – this compares with 56.2% for the Class of 2008, and contrasts sharply with figures of 55-58% regularly measured in the 40 years prior to the recession, but stands as an improvement over the 49.5% measured for the Class of 2011. The public sector continues to be a solid source of jobs for law school graduates, with jobs in government, as judicial clerks, in public interest organizations, and with the military all serving as steady sources of work, and collectively employing just under 30% of the graduates who obtained jobs. Employment in jobs in business fell slightly for this class, from 18% to 17.2%. Additionally, this year’s data show that most employed graduates continue to be in positions that use their law degree in some way. Of employed graduates, 76.8% obtained jobs for which bar passage was required and 16.7% had JD advantage (law-related) positions. After being completely flat for two years, mean and median starting salaries for the Class of 2015 did see some modest growth. The overall median starting salary grew by almost three percent, from $63,000 to $64,800, and the median law firm starting salary grew by five percent, from $95,000 to $100,000. It is important to note that this salary growth was measured well before the recent run-up of starting salaries to $180,000 for entry-level associates at the largest firms, and it is therefore all but certain that for the Class of 2016 the means and medians will jump again, and likely by a larger percentage. Moreover, while aggregate salaries have come up somewhat from the lowest post-recession figures measured in 2011, the earning power of the class as a whole is still well below what it was in 2009 when the law firm median starting salary stood at $130,000, the highest figure ever measured. The main reason for this is that despite the recent growth in recruiting by large law firms, the number of entry-level associate positions at large law firms still remains well below what it was in 2011. 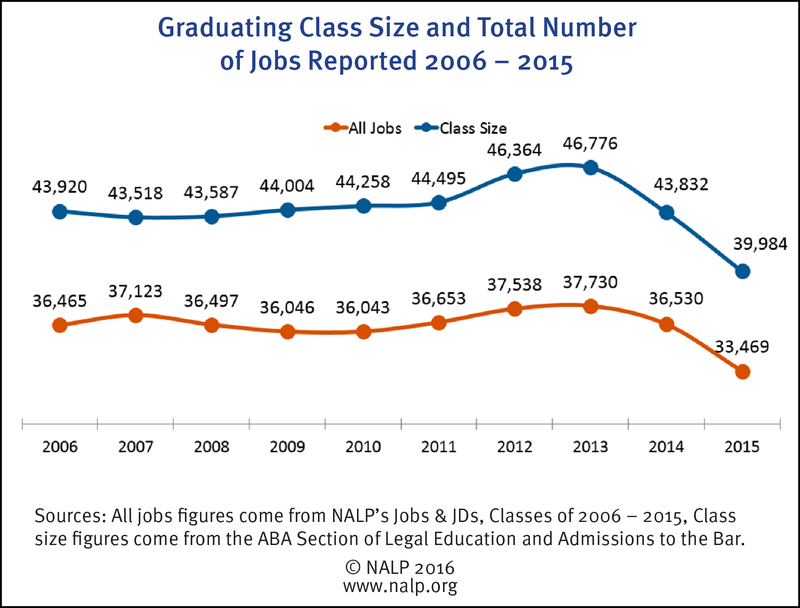 Also of note, law school-funded jobs for the Class of 2015 were down more than 35% from the previous year following the ABA decision to reclassify how these jobs are recorded and counted, and are down 45% from two years ago. The full text of “Employment for the Class of 2015 — Selected Findings” can be found at www.nalp.org/classof2015. The findings of NALP’s Employment Report and Salary Survey for the Class of 2015 will be reported in much greater detail — including salary detail and analyses of employment and earnings by geographic market — in Jobs & JDs: Employment and Salaries of New Law School Graduates — Class of 2015 — to be published in October 2016. NALP is an association of over 2,500 legal career professionals who advise law students, lawyers, law offices, and law schools in North America and beyond. What brings NALP members together is a common belief in three fundamental things. First, all law students and lawyers should benefit from a fair and ethical hiring process. Second, law students and lawyers are more successful when supported by professional development and legal career professionals. Third, a diverse and inclusive legal profession best serves clients and our communities. That’s why NALP members work together every day to collect and publish accurate legal employment data and information, and champion education and standards for recruiting, professional and career development, and diversity and inclusion. For more than 40 years, NALP has played an essential role in the success of our members and the lawyers and law students they serve. NALP maintains an online archive of press releases at www.nalp.org/pressreleases. For additional information about NALP research, contact Judith Collins (jcollins@nalp.org), Director of Research, or James G. Leipold (jleipold@nalp.org), Executive Director.